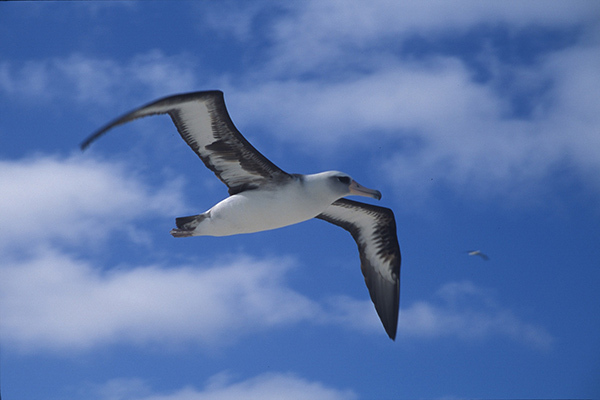 Laysan albatross are experts at soaring and can travel hundreds of miles per day with barely a wingbeat. The Great Pacific Garbage Patch is a significant threat to their survival. In one of the most remote places on Earth, an albatross fight is taking place. The battleground is the Midway Atoll, located more than 2,000 miles away from the nearest continent. On this small island, situated in the heart of the Pacific Ocean near the northwestern end of the Hawaiian Islands archipelago, the birds are facing a formidable foe: our plastic waste. Today, Midway holds the largest Laysan albatross colony in the world. These magnificent and beautiful seabirds range over the entire Pacific Ocean from their home base on the island. But Seattle-photographer-turned-documentary-codirector Chris Jordan would like us to see the other side of this bird-world outpost: here, tens of thousands of albatrosses die, their bodies filled with plastic from the Great Pacific Garbage Patch. Scientists estimate that approximately five tons of plastic arrive on Midway Atoll every year in the stomachs of these birds. Watch the short video below, which is a trailer for the 2013 feature-length film Midway: Message from the Gyre. According to the Midway website, the film is both elegy and warning. If you would like to see varieties of albatross and help in their conservation, please consider our Galapagos adventures and New Zealand ecotour. White contribution is very illuminating, but the problem is the developed economies whose populations are too hungary for convinient packages to carry, to cover and so on. The responsibility to reach the ideals of sustainable living comes to the developing economies but whose activities are rarely reported and whose ways of life are never considered by the globally recognised ways of life. Let the campaigns begin in the western world to live more responsibly! Thank you Candice for sharing this video. It is so heartbreaking to see that these animals have to suffer for our carelessness. In response to Kirsi’s comment – I envy how serious Sweden takes recycling and caring for our planet. For example, down in Savannah, GA, the neighborhood my family lives in does not provide any facilities or options for people to be able to recycle. If anything the recycling bins that were located throughout the neighborhood were removed a few years ago. It is so crazy to think in the day and age we live in, that there are places that are backtracking when it comes to protecting the environment. Thanks for that post! Let’s get the message out there. Look people: although going around picking up the rubbish is a great idea, as several of you already mentioned we’d never manage to do it. The basic problem is that WE produce stuff! The world’s oceans are full to bursting with plastics. I work on very remote atolls, where we get rubbish washing onto our beaches ~ none, or very little, comes from our places, and about 94% is manufactured plastics ~ all the stuff that you so love in your supermarkets and plasticised way of life. All the time we keep producing this stuff our problem is never going to go away. Plastics were only invented around 100 years ago, and the first decade of this millennium produced more plastics than during the entire 20th Century ~ so it’s going to get far worse. We either change our lifestyles or we don’t. Biodegradation times are very long for many plastics: I’ll give a good example ~ ‘disposable’ nappies (diapers) take about 450 years to break down in the ocean (data from NOAA). That means if you put 3 nappies a day on your infant (and many of these nappies will end up in the sea) you’ve clocked up 1350 years environmental pollution per day/per child. It is NOT sustainable. Those of us that work in the marine sciences do understand the issues, and we’ve been dealing with endangered animals eating plastics for years. Plastics are in the food-web, beacause as they break down, the filter feeders and detritivores consume them, then the smaller fishes, then the larger ones, and then us. This bioaccumulated plastic then gets incorporated into our DNA. QED. South Africa south-east coast (Indian Ocean). Candice, thanks for the video, quite scary to see the stomach contents and quantum of plastics in the birds. Most mornings I pick up whatever plastic pieces I find over a 400 m stretch of beach. Can be 30 to 100 and more. It just keeps coming in with every tide. Our oceans are sure alive with plastic but no music. Heard of the vast floating soup of plastic in the eastern Pacific. Anyone got aerial pic’s? How terribly sad. Humans are polluting and destroying so much of our planet. As always, it’s the other species who suffer most. Heartbreaking. Good points. Pricing is essential to stopping plastic use. Sadly, much of one use plastics don’t even need to be used. I often ask people why they need a plastic straw to drink a cold drink. If we could eliminate plastic straws that alone would significantly reduce plastic pollution. This is not good for biodiversity in earth. How can we help. This is a terrible disgrace upon the human species–and the plastics industry. I’ve said it before, and again–the world is over developed and overpopulated. Big corporations, like Coca Cola, Pepsi, Nestle and others who fill plastic bottles and then don’t worry about how many or how much those pollute, are shameful. Kristina, I absolutely agree with your idea that educating families about sustainable behavior is very important. It is undisputable that environmental education is one of the best remedies to support environment friendly attitudes. Some our schools included in their ecology lessons practical cleaning actions on river banks and lake shores that teens take part in. In total we have picked up garbage from river banks that is volumed more than ten 20-ton trucks. It seems that for huge areas any cleaning effort will be never completed but we believe that sooner or later we’ll have water flows with no garbage at all. Thank you Candice for posting this Great Pacific Garbage Patch. It is really important for people to be aware of this situation. I pray one day that something will be done to help and save albatrosses, in what way and what, only TIME can tell when this NATURE will heal. It is time to ban all plastic packaging and one time use plastics. Thanks for sharing the video. It’s an awful reality. Great film – shocking, factual, clear. Gyre known about for 10+ years. Also turtles and what else affected by the large stuff, but plastic is breaking down and being ingested at micorscopic level from bottom of food chain up. Sorry for being niave, but while we all get up to speed on prevention at source – why aren’t we clearing this up? What is happening on Midway breaks my heart. Because it’s so out of the way, few people are aware of it. I was fortunate to see Chris Jordan’s documentary “Midway” at TIFF, and hope it is picked up by film distribution companies so that more people become aware of what our disregard for plastic garbage is doing to the albatrosses. Thank you for sharing the video. Midway Atoll is a remarkable place and it deserves our attention. While there is tragedy there, the good news is there is a tremendous amount of life. Even with limited resources, the U.S. Fish and Wildlife Service deserves a ton of credit for its work protecting the birds on the atoll. There are some truely dedicated people working in remote places to benefit all of us, and these miracles of nature. Hello, the problem that some birds and other animals cannot make distinction between their natural food and plastics need to be urgently thought of. This is one more reason to reduce using plastic packages as much as possible. A very emotional and touching video. Thank you Candice for sharing this. It´s very, very hard for me to understand why people, in these modern days with all this knowledge, can´t understand that the garbage they leave behind them with no sense of responsibility, affects something or someone else. When people buy something made of especially plastic, where do they think this will go when they throw or leave it in the nature? Do they imagine that it just disappear of itself? For me it´s quite hard to see this video, especially when living in a society where recycling is taken seriously. In Sweden there are quite strict laws to protect our environmental. Almost every appartement building has a recycyling room where you have to throw in different bins depending on if it´s plastic (both soft and hard plastic can be thrown in the same bin nowadays. They have new ways to process them together in our recycling mills), metal, glass (separate bins for clear and colored glass), and separate bins for cardboard and newspaper. There are also bins for other bigger garbage which doesn´t match those previous such as plants, clothes, shoes, ceramics etc, and bins for more harmful objects such as bulbs, thermometers, chemicals etc. In my house there still is a traditional garbage chute on every floor in the building, here you throw the organic material and garbage that can be burnt. The garbage truck, served by our municipality, then bring this away once a week. This chute isn´t longer common in most houses, instead the recycling rooms have bins for that kind of garbage too. For those living in own houses, they have bins outdoors for separately organic garbage and garbage that can be processed by burning it. The local municipality serves the bins and brings the garbage away. Other bigger garbage people have to take with them to special reserved places scattered around the town, kind of recycling stations, where bigger containers stand. Then there are those large special recycling stations with containers for heavier stuff such as dangerous chemicals, building material etc. Here you can throw other garbage such as glass, metal, cardboard etc. Those large stations are served by the municipality as well. So, recycling is on our agenda, as you see. The municipality post every year statistics to the citizens about the recycling and how good we have been to recycle and which effect it gives so that we are updated about our efforts. I think that there has to be more responsibility from politicians and decision makers to start larger actions so that people listen better and understand that this is every person’s responsibility against their environment and future generations. It´s also a responsibility for the industrialized countries to think through when they deliver a lot of garbage to the developing countries with poor organization for processing the garbage. The problem is quite complex, but it can always start with the individual and everybody’s own consciousness…and compassion…to begin with. This is excellent, thank you! I will share with as many people as possible. I have seen and read about he Pacific garbage patch but never something on the Midway Atoll. This should be shown in Cannes, or better still at a break during the Oscar ceremony, or at the UN General Assembly, just after the opening words of the Secretary General…. I saw this a long time ago. Thanks for sharing again. Its such an important video to watch. Hello; Just think; this is only one iceberg tip; conduct a cumulative global environmental impact study across all scientific disciplines; the reality of human planetary damage is past horrific. We; as a species; are the worst thing to ever inhabit this planet during our known historical ancestry !!!!!! For our sake; our future generation’s sake; and for the continuance of all life on this planet; WE ALL BETTER WAKE UP AND GET BUSY CLEANING OUR COLLECTIVE GLOBAL MESS – NOW IS THE TIME FOR ALL GOOD PEOPLE TO COME TO THE AID OF OUR PLANET ! TEMPUS FUGIT! This video clip will be great for my EFL adult students who lack a genuine concern for their environment. Will use it in my Environmental Management course. Since the Tsunamis Garbage in the Oceans has become an increasingly Serious Danger to Wildlife. Why can’t the Destructive Marine Life Fishing Trawlers convert to Marine Garbage Trawlers? The Gyres where Rubbish Collects in the Oceans would be a good start for Garbage Trawling. And all Coastline Beaches etc. need the same Garbage Removal Treatment. We need Living Oceans with Fish and Marine Life Biodiversity in our Future, the Devastation of Oceans needs a Change in Human Behaviour before Marine Life Stops…. This is tragic…and only one of the thousands of species affected by anthropic debris in the oceans. Nicely written Candice. Very moving! Thanks for making us aware. everytime I see this it makes me cry!!! !